The ability to create 3D tissues from induced pluripotent stem cells (iPSCs) is poised to revolutionize stem cell research and regenerative medicine, including individualized, patient-specific stem cell-based treatments. There are, however, few examples of tissue engineering using iPSCs. Their culture and differentiation is predominantly planar for monolayer cell support or induction of self-organizing embryoids (EBs) and organoids. 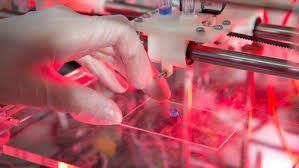 Bioprinting iPSCs with advanced biomaterials promises to augment efforts to develop 3D tissues, ideally comprising direct-write printing of cells for encapsulation, proliferation, and differentiation. Here, such a method, employing a clinically amenable polysaccharide-based bioink, is described as the first example of bioprinting human iPSCs for in situ expansion and sequential differentiation. Specifically, There are extrusion printed the bioink including iPSCs, alginate (Al; 5% weight/volume [w/v]), carboxymethyl-chitosan (5% w/v), and agarose (Ag; 1.5% w/v), crosslinked the bioink in calcium chloride for a stable and porous construct, proliferated the iPSCs within the construct and differentiated the same iPSCs into either EBs comprising cells of three germ lineages—endoderm, ectoderm, and mesoderm, or more homogeneous neural tissues containing functional migrating neurons and neuroglia. This defined, scalable, and versatile platform is envisaged being useful in iPSC research and translation for pharmaceuticals development and regenerative medicine.